An inmate has been found guilty of ordering a murder from his cell using a mobile phone smuggled into the prison. Delphon Nicholas, 29, from Lewisham, south-east London, was convicted of murdering Andrew Wanogho, in nearby Brockley on 8 April 2006. The Old Bailey trial heard that Nicholas had made dozens of calls from his cell in London's Belmarsh prison to gunman Trevor Dennie, 33. Dennie was also found guilty of murder but three other people were acquitted. They were Sereata Barrie, 29, Michael Williams, 28, both from Lewisham, and Erran Cato, 25, from Stamford Hill, north London. Nicholas and Dennie will be sentenced on Friday. 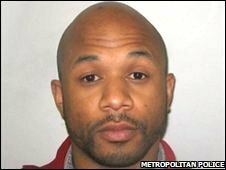 Mr Wanoghu, 26, was shot in the street after being lured to an address in south London in a trap organised by Nicholas. In 2002, he faced a murder trial himself following the shooting of Damian Cope, 24, outside a club in Holborn, central London. But he was acquitted after two witnesses refused to give evidence in the case. Mr Cope's mother, anti-guns campaigner Lucy Cope, pleaded for people to come forward to help catch her son's killer but no one else has been charged. The trial heard Nicholas and Mr Wanogho had been friends but they had fallen out. In February 2006, Mr Wanogho - known by the street name Sparks - insulted Nicholas by assaulting his father and stealing his car. Prosecutor Aftab Jafferjee QC said Mr Wanoghu was "set up for execution". He told the jury said Nicholas "orchestrated the execution" from inside Belmarsh prison by using the mobile telephone. At the time, he had been on remand at the jail on an unrelated matter of which he was later found not guilty. After the verdicts, prisons minister David Hanson MP said the government was committed to "tackling and disrupting" the use of illegal mobile phones in prisons. "We are also making full use of the new legislative provisions in the Offender Management Act 2007 which makes it a criminal offence for staff, visitors and prisoners to bring mobile phones into a prison." What can be done to stop criminals using mobile phones in jail? Care to sit on the Boss chair?